Our ‘Sanguna Moody Blues’ Combination is a combination of “blue” blossoms that are anything but sad. 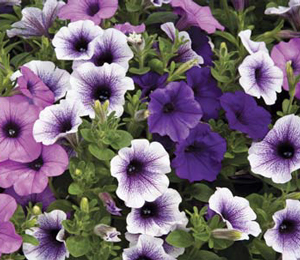 Some of the happiest colors in the petunia world have come together in this combination planting; Sanguna Blue, Lavender Vein and Blue Vein are all highly complementary of each other, this visual treat guaranteed to impress! The plants in our 'Sanguna Moody Blues' plants are grown and shipped in fine quality growing medium and are guaranteed to arrive alive and ready to thrive.